Frank Miller is an American comic book artist, writer and film director best known for his brooding, dark, film noir depictions of famous comic characters and the development of noir dystopias, Batman: The Dark Knight Returns, Sin City and 300, Ronin and Daredevil: Born Again. 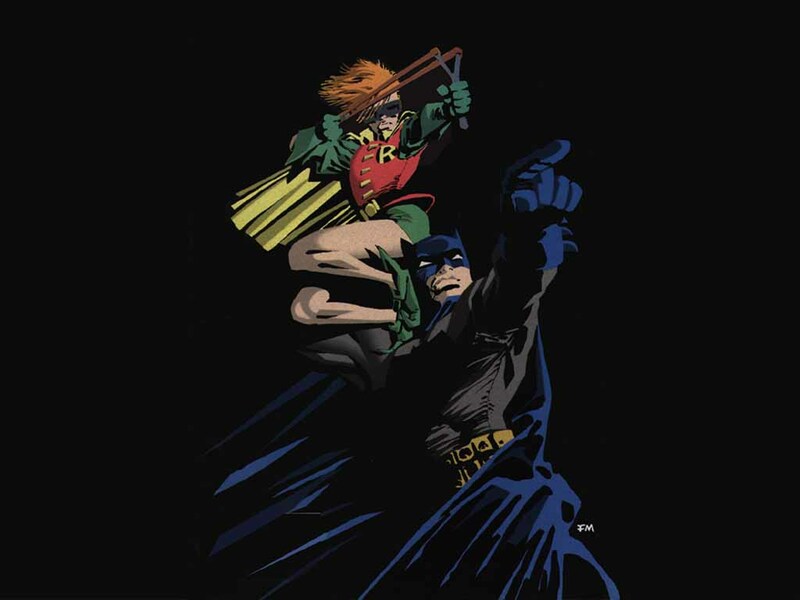 Batman : Dark Knight Returns is viewed as a seminal work in comics history, mandatory for any that want to understand what (along with Alan Moore’s Watchmen) changed the face of comics so dramatically in the 1980s. He is also, nowadays, a liberal hate figure after outspoken statements regarding protest camps in the US and UK against multinational corporations. This, among other things, has placed a pall over his previous work, calling into question his politics and views on women, crime and society. Miller was born in Olney, Maryland and raised Montpelier, Vermont, the fifth of seven children of a nurse mother and an electrician/ carpenter father. He was raised as an Irish Catholic. Setting out to become an artist, Miller recieved his first published work at Western Publishing’s Gold Key Comics imprint on the comic book version of The Twilight Zone, drawing ‘Royal Feast’ in issue #84 (June 1978), and “Endless Cloud” in #85 (July 1978). Jim Shooter, one-time Marvel Editor-in-chief recalled Miller’s attempt to join DC, emboldened by his sign up with Western Publishing. “He went to DC, and after getting savaged by Joe Orlando, got in to see art director Vinnie Colletta, who recognized talent and arranged for him to get a one-page war-comic job”. Miller’s first listed work is the six-page “Deliver Me From D-Day”, by writer Wyatt Gwyon, in Weird War Tales #64 (June 1978). A two-page story, however, written by Roger McKenzie and titled “Slowly, painfully, you dig your way from the cold, choking debris…”, appears in Weird War Tales #68 (Oct. 1978). Other fledgling work at DC included the six-page “The Greatest Story Never Told”, by writer Paul Kupperberg, in that same issue, and the five-page “The Edge of History”, written by Elliot S. Maggin, in Unknown Soldier #219 (Sept. 1978). and his first work for Marvel Comics, penciling the 17-page story “The Master Assassin of Mars, Part 3” in John Carter, Warlord of Mars #18 (Nov. 1978). 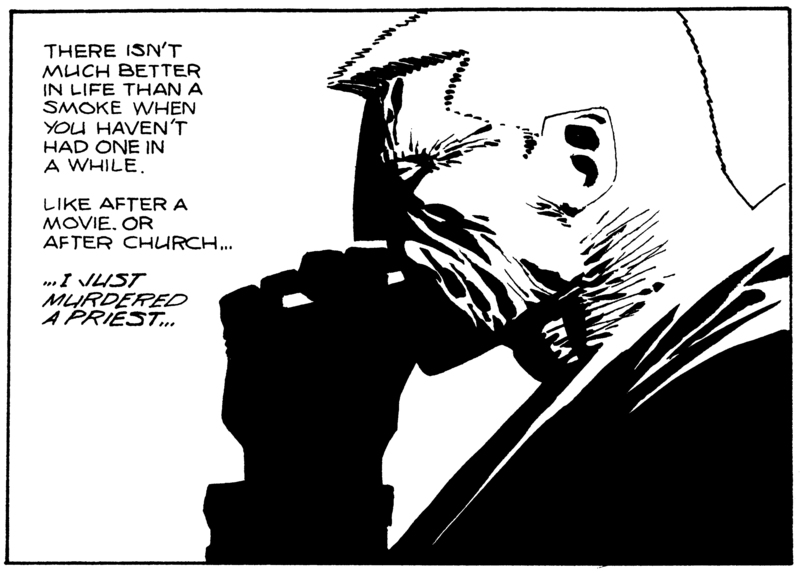 Although still conforming to traditional comic book styles, Miller introduced his noir style to the pages of Daredevil on his debut, joining on a finale of an ongoing story written by Roger McKenzie. Living in Hell’s Kitchen in the 1980s Miller sketched the roof tops of his surrounding neighbourhoods and imbued the title with a greater accuracy than fans had seen before. New York was now a more dangerous place. His work was cited as reminiscent of German Expressionism’s dramatic edges and shadows as the Red Devil fought mostly now at rooftop level, among the water towers, pipes and chimneys. Miller’s run was successful enough to bring Daredevil back from being a bi-monthly title to a monthly one but that was far from the limit of the success. With the departure of Roger McKenzie, Miller took over as writer and penciller, with long time collaborator Klaus Janson on inks introducing a skittish, visceral feel. Art became to form. Violence bled (within the limited parameters of the Comics Authority), fear was felt, anger and danger were portrayed. Everything was comics +. This was a slightly more frenetic, powerful version of the superhero canon – the focus on the darkness in the lives of the bright tights. 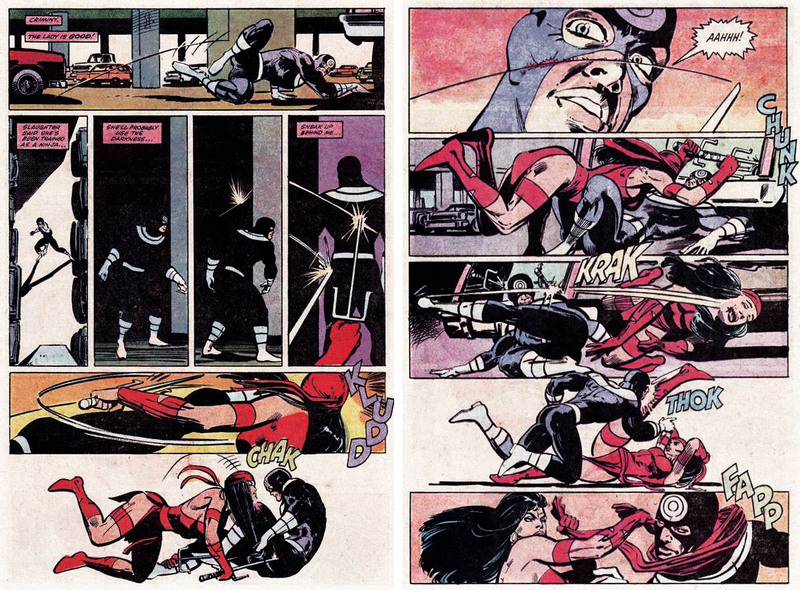 Issue #168 saw the first appearance of the ninja mercenary Elektra, who despite being an assassin-for-hire would become Daredevil’s love-interest. Miller would write and draw a solo Elektra story in Bizarre Adventures #28 (Oct. 1981). This further characterised Miller’s work on Daredevil with darker themes and stories. This peaked when in #181 (April 1982) he had the assassin Bullseye kill Elektra. Miller finished his Daredevil run with issue #191 (Feb. 1983); in his time he had transformed a second-tier character into one of Marvel’s most popular. Working with Chris Claremont at Marvel on Wolverine 1-4, inked by Josef Rubenstein and spinning off from the popular X-Men title, Miller used the series to expand on Wolverine’s character. The series was a critical success and cemented Miller as an industry star. Taking an older, curmudgeonly and effectively lonely character and dropping him into a world of greater brutality and violence proved very popular – the Wolverine series still continuing today, surviving the collapse of comics in the mid 90s and still going strong. While other great artists such as Adam Kubert and Marc Silvestri continued and concreted it’s success, Claremont and Miller set the tone. Brutal, fringe figures were quickly becoming Miller’s niche. In Miller’s first creator-owned title, Ronin, Miller had found himself with his original quarry, DC, and he was given the opportunity to further the concept of the isolated figure of violence on the edge of society. 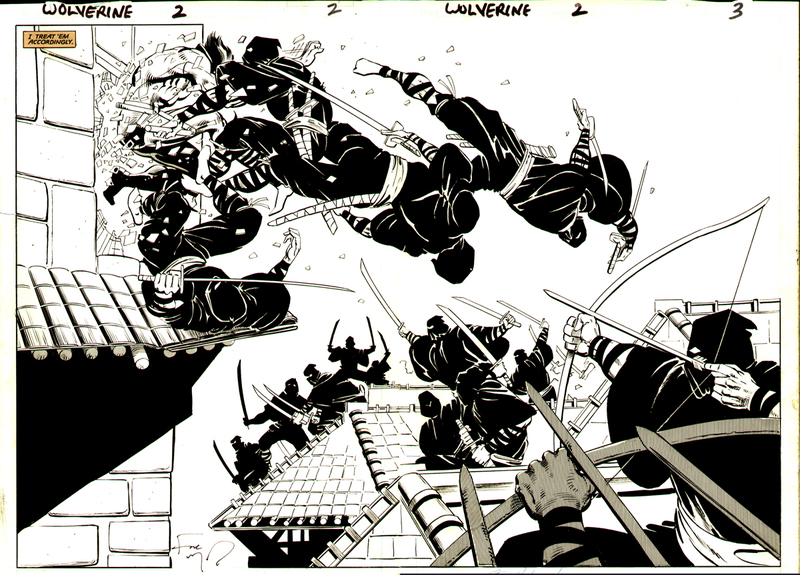 Ronin revealed most clearly the influences of Manga and bande dessinée artforms on Miller’s style, both in the artwork and narrative style. In the early 198os Miller and Steve Gerber proposed a revamp of DC’s central figures entitled ‘Man of Steel’, ‘Dark Knight’ and the frankly less inspiring ‘Amazon’. This proposal was rejected, however the first shoots of a seed of an idea were clearly being shown in those proposals. 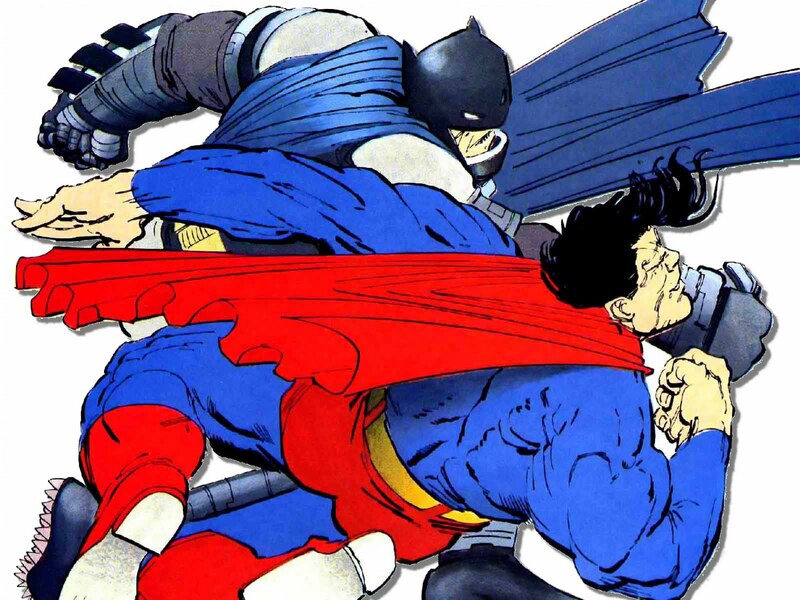 While the Man of Steel and the Amazon remained as they were, The Dark Knight was set to rise. In 1985, before the release of Miller’s finest work, he was honoured as one of the 50 honourees in the Company’s 50th Anniversary publication Fifty Who Made DC Great. Had they left it one more year, Miller would have rocketed into the top 5 with the release of the Dark Knight Returns. At the age of 55, Bruce Wayne returns to the hilt and takes back his role of Batman, it showcased a more adult form of comic-book storytelling by heralding new waves of darker characters. Miller, much like Moore, absorbed a great deal of the world around it though Miller twisted his into a more immediately engaging shape. Punk Gangs and Neo Nazis rule the streets alongside older, more familiar foes – all now even darker than before. The smell of paranoia over the Cold War and the threat of Nuclear War is musky in The Dark Knight, increasing the pall of murk that has descended on Gotham. Simultaneously though Miller gave voice to both liberal and right wing opinions during the series, through continual talking heads on various invented TV shows. With the themes of media, crime, personal responsibility, federal control, public opinion and the futility of redemption, Dark Knight represents a dark and risible future. It was excellent. A timely chime on a bell of collective paranoia, it tapped perfectly into the state of mind of society at the time. Rather than the patronising resolution by brightly coloured gods – here the solution contains only glimmers of salvation but deep shades of absolutism. It satisfies fully as emotional resolutions are struck so rarely in the real world, rarely in conjunction with the resolution of situations. In Miller’s world there are no easy answers. 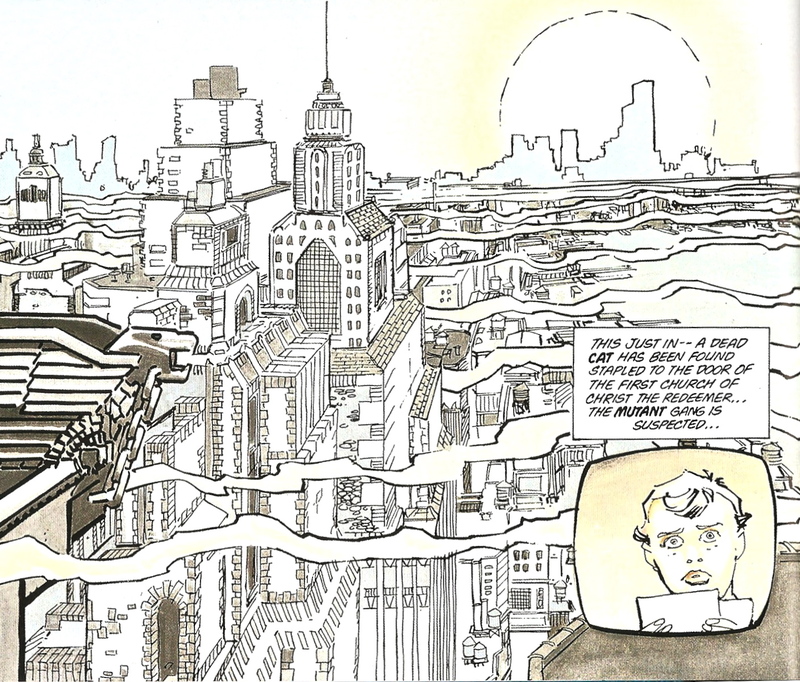 His worlds roll on beyond the final panel, stories often unfinished, character’s unresolved. 25 years later the collected novel remains a timeless best seller. Kapow: A Round Up on Kapow Diary 1: View from the desktop.